Location: Belle Ville Hotel is located in the center of the Old Town. 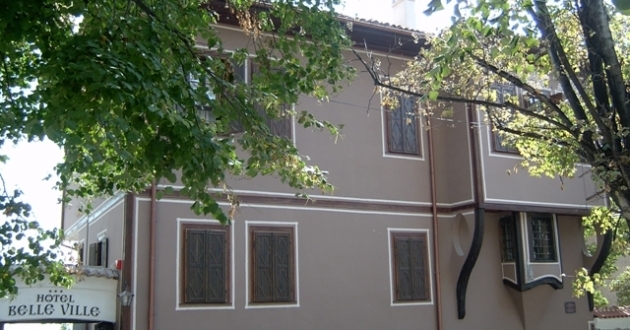 It is a restored authentic house built during the period of National Revival period, owned by Nedyalko Nemski, the first Director of the Archaelogical Miseum, Plovdiv . The building is a national monument of culture , because of this it was renovated entirely according to the original plan. The house is interesting and unique because of its non-symmetrical facade and bow-window with the typical for the period ‘gossip house”. In the wide yard of the hotel can be seen an original marble well, as well as many plants, flowers and a fig tree. Accommodation: The hotel has 6 rooms and 2 suites. Each room is painted in different color and the furniture is entirely in the typical Renaissance style which preserves the spirit of the cultural atmosphere in the city of Plovdiv of this period. All the rooms are equipped with air-conditioning, cable TV, mini bar, telephone, free Internet access. In the hotel: The restaurant offers 40 seats inside and 40 more seats in the garden of the hotel yard. Guests of the hotel may choose among the great variety of traditional Bulgarian and European cuisine. There is also a conference hall for up to 20 people.